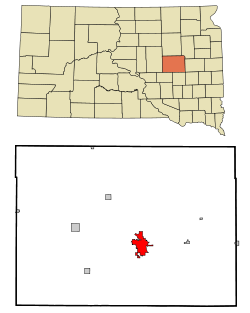 Huron is a city in the eastern part of South Dakota, United States. It is the county seat of Beadle County, and 12,592 people lived there at the 2010 census. Huron became a city in 1883. ↑ 1.0 1.1 "American FactFinder". United States Census Bureau. Retrieved 2013-06-03. This page was last changed on 22 May 2018, at 06:50.